If you run ultravnc server for the first time, the settings "ultravnc.ini file" does not exist and firewall need to allow winvnc. When no password has been set, ultravnc prompt you to set one. When you are running on XP and winvnc was installed as service you first get the "runas"
* Use the installer and select viewer only. * Or, copy vncviewer.exe on a usb stick and plug this in your viewer PC. * Or, use a shared/mapped folder and copy. The server ip address can be found by hovering the mouse over the vnc server tray icon. B. Server has a private ip and use a Nat router to connect to the internet. The router has the official ip address. If your server has an ip address that's in one of the above ranges you are using some nat router to connect to the internet and the viewer can not make a direct connection to the server. The solution is tell the nat router that he need to send a port to your local pc , the viewer connect to the nat router ip address. Mirror driver only get downloaded, NOT installed. This need to be done manual. winvnc systray. First test if it works, and then register as service when needed. If you need to install UltraVNC on a large number of computers, you might consider automating the installation. Sets installation directory to Dirname. Suppresses a reboot at the end of the installation. Not required since the installation no longer requires are boot. Suppresses either pop-up of dialog boxes or any GUI at all. Loads the configuration file Filenamefor the installation. This configuration file can be generated by going through setup with UltraVNC-xxxx-Setup.exe /saveinf="Filename". Filename should be fully qualified. Writes a log file to the Temp directory. Could be used for debugging. you don't put -run at the end. 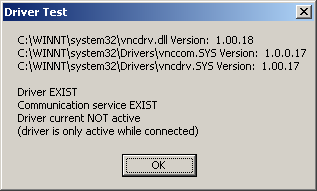 This tell the service to make an invers connection to 192.168.1.30 and retry when it fail. When doing a file transfer, act as desktop user. When you don't put 1 the filetransfer is done as user "system". User system don't have access to mapped drives and pose a security issue... a normal user can FT as admin. Capture alphaBlending is needed for semi transparent windows ( xp, vista...) but use more cpu. Instead of using the powermanager to blank the monitor we put a layered window on top and capture the windows below. Using this option you also can define a custom blank by placing a file "background.bmp" in the ultravnc folder. The port is 5900, but when port 5900 is already in use the auto mode take one higher until he find a free one. This can be used for Japanese and other non standard keyboards. The key processing is different and sometimes solve issue's with special keys. instead of 10.0.60.141 you can use 10.0.60, then it is valid for the full range of ip addresses. Define on how to react on the (-,?,+) from the Authhosts. In the above, [ip-address-template] represents the leftmost bytes of the desired stringified IP-address. For example, +158.97 would match both 158.97.12.10 and 158.97.14.2. Multiple match terms may be specified, delimited by the ":" character. Terms appearing later in the template take precedence over earlier ones. e.g. -:+158.97: would filter out all incoming connections except those beginning with 158.97. Terms beginning with the "?" character are treated by default as indicating hosts from whom connections must be accepted at the server side via a dialog box. The QuerySetting option determines the precise behaviour of the three AuthHosts options. QueryTimeout is the time the messagebox is shown. This popup a timed messagebox to allow the user (server site) to allow/reject an incoming connect. Disable/enable query settings when no user is logged. If the user is logged on, but has his screensaver on you normal can't get access as "QueryIfNoLogon" find a logged user. to overwrite this set QueryAccept=2 and QueryIfNoLogon=0 -> no messagebox when screen is locked. A image as background takes more cpu and bigger bandwidth then a solid color. Disable on viewer connect, reenable on exit. Remove Aero on viewer connect and reset on exit. By default, WinVNC servers disallow any vnc viewer connections from the same machine. For testing purposes, or, potentially, when using multiple instances of WinVNC on Windows Terminal Server, this behaviour is undesirable. By default, WinVNC servers accept incoming connections on an network adapter address, since this is the easiest way of coping with multihomed machines. In some cases, it is preferable to only for connections originating from the local machine and aimed at the "localhost" adapter - a particular example is the use of VNC over SSH to provide secure VNC. Setting this will cause WinVNC to only accept local connections - this overrides the AllowLoopback and AuthHosts settings. Don't show the winvnc tray icon. Without the tray icon you can't make realtime changes. You need to edit the ultravnc.ini manual or use the uvnc_settings.exe to modify the file. Settings take efect after winvnc restart. connections when an incoming, non-shared connection is authenticated. This behaviour is undesirable when the server machine is being used as a shared workstation by several users or when remoting a single display to multiple clients for viewing, as in a classroom situation. By default, all WinVNC servers will not accept incoming connections unless the server has had its password field set to a non-null value. This restriction was placed to ensure that misconfigured servers would not open security loopholes without the user realising. If a server is only to be used on a secure LAN, however, it may be desirable to forego such checking and allow machines to have a null password. Bad updates, only poll screen when mouse/keyboard is used. Parameters are order dependent !! Is used in conjunction with the -connect switch when having a server "Reverse-connect" to a listening viewer. You can use it in a batch file for your clients that are behind a firewall that is not under your control. On the local computer run the viewer in "listening" mode, and have someone on the server end run the batch file. The -autoreconnect will make the server end attempt to reconnect to the listening viewer if the connection drops or is closed. It will immediately reconnect to the listening viewer if the session is closed. Close the listening viewer altogether in order to stop the server end from "autoreconnecting" to your computer. The server attempts to "autoreconnect" for only a few seconds. Note that this "autoreconnect" param must be before the "connect" one on the command line! host in "-connect host..." is the repeater. This option modify some behavioiur for Single Click usage. Internal used to be able to save to ultravnc.ini. On >= Vista, the program folder is a protected folder and require elevated permission. to the real ultravnc.ini in program files. Internal used for the special service_commandline option in ultravnc.ini. Internal used by winvnc. The helpers are needed to simulate the current console user ( Service run as system). The start winvnc with the corresponding command line without "helper" with the "runas" option.